In the wake of violent incidents in which symbols of the Civil War Confederacy have played a role, Congress is considering the relationship of Confederate symbols to federal lands and programs. A number of federal agencies administer assets or fund activities in which Confederate memorials and references to Confederate history are present. This report focuses on three federal entities—the National Park Service (NPS), the Department of Veterans Affairs (VA), and the Department of Defense (DOD)—that manage multiple sites or programs involving Confederate symbols. The report discusses the agencies’ policies concerning Confederate symbols, recent legislative proposals, and issues for Congress. NPS manages over 70 units of the National Park System related to Civil War history, some of which contain works commemorating Confederate soldiers or actions. NPS also administers national cemeteries that display the Confederate flag at certain times. Further, the agency is connected with some state and local Confederate memorials through its historic preservation assistance to nonfederal sites. NPS manages its Confederate-related assets in the context of its statutory mission to preserve historic and cultural resources unimpaired for future generations. NPS engages in interpretation and education about these symbols. Within DOD, the Army administers 10 major installations named after Confederate military leaders; there are no such installations for the other military departments. The Army also has jurisdiction over Arlington National Cemetery, which contains a section for Confederate graves and a monument to Confederate dead. More broadly, the military services have considered Confederate symbols in the context of policies for good order and discipline within units. Only the Navy has an overall policy on the display of the Confederate flag. The presence of Confederate symbols in federal lands and programs may raise multiple questions for Congress. Confederate flags, statues, plaques, and similar memorials have been valued historical symbols for some Americans, but for others have symbolized oppression and discrimination. How should differing views on the meaning of these symbols be addressed? What constitutes a Confederate symbol, and should some or all of these symbols be removed from federal sites, or alternatively, preserved for their historical or honorary significance? Are current interpretive efforts adequate to convey the history of these symbols, or should federal agencies offer additional education and dialogue about their role in Civil War history and in subsequent historical eras? How, if at all, should current practices of honoring the Confederate dead in national cemeteries be changed? To what extent, if any, should the presence of Confederate symbols at nonfederal sites affect federal funding for programs connected to these sites? Recent legislative proposals, including H.R. 3658, H.R. 3660, H.R. 3701/S. 1772, H.R. 3779, and H.Res. 12 in the 115th Congress, would address these issues in different ways. They range from bills concerned with individual Confederate symbols to those that would broadly affect all Confederate symbols on federal lands. In some cases, questions could arise about how the proposals would be implemented from a logistical and financial standpoint, and how they would interact with existing authorities. In the wake of violent incidents in which symbols of the Civil War Confederacy have played a role, Congress is considering the relationship of Confederate symbols to federal lands and programs. A number of federal agencies administer assets or fund activities in which Confederate memorials and references to Confederate history are present. This report focuses on three federal entities—the National Park Service (NPS), the Department of Veterans Affairs (VA), and the Department of Defense (DOD)—that manage multiple sites or programs involving Confederate symbols. The report discusses the agencies' policies concerning Confederate symbols, recent legislative proposals, and issues for Congress. Through its National Cemetery Administration, the VA administers 135 national cemeteries, many of which contain the remains of Confederate soldiers. The VA also provides grants to assist with the establishment of state veterans' cemeteries. Confederate graves in VA cemeteries may have a special headstone that includes the Southern Cross of Honor, and may display the Confederate flag at certain times. The VA website also identifies 34 monuments and memorials in national cemeteries that explicitly honor Confederate soldiers or officials. Management takes place in the context of the VA's mandate to maintain national cemeteries as "national shrines." Congress is considering the role of Confederate symbols on federal lands and in federal programs. While no comprehensive inventory of such symbols exists, numerous federal agencies administer assets or fund activities in which Confederate memorials and references to Confederate history are present. The National Park Service (NPS, within the Department of the Interior), the Department of Veterans Affairs (VA), and the Department of the Army within the Department of Defense (DOD) all administer national cemeteries that sometimes display the Confederate flag. Many units of the National Park System are related to Civil War history and contain resources commemorating Confederate soldiers or actions. The Army has military installations named in honor of Confederate generals, and some Navy ships have historically been named after Confederate officers or battles.4 The U.S. Capitol complex contains works commemorating Confederate soldiers and officials, including statues in the National Statuary Hall Collection.5 Various federal agencies such as the General Services Administration and the Department of Transportation are connected with sites of Confederate commemoration, either on federal properties or through nonfederal activities that receive federal funding. The presence of Confederate symbols on federal lands, and at some nonfederal sites that receive federal funding, may raise multiple questions for Congress. How should differing views on the meaning of these symbols be addressed? Which symbols, if any, should be removed from federal sites, and which, if any, should be preserved for their historical or honorary significance?6 Should every tribute to a person who fought for the Confederacy be considered a Confederate symbol? Should federal agencies give additional attention to education and dialogue about the conflicted history of these symbols—including their role in Civil War history and in subsequent historical eras—or are current interpretive efforts adequate? How, if at all, should current practices of honoring the Confederate dead in national cemeteries be changed? To what extent, if any, should the presence of Confederate symbols at nonfederal sites affect federal funding for programs connected to these sites? This report focuses primarily on Confederate symbols administered by three federal entities—NPS, the VA, and DOD. Each of these entities manages multiple sites or programs that involve Confederate symbols. The report begins with a discussion of recent legislative proposals, and then discusses the agencies' current policies with respect to Confederate symbols, along with issues for Congress. Bills in recent Congresses have addressed Confederate symbols and their relation to federal lands and programs. The 115th Congress is considering bills with varying provisions on Confederate commemorative works, names, and other symbols under federal jurisdiction. The 114th Congress also considered several legislative proposals, but none were enacted in law. Of the pending proposals in the 115th Congress, some might be relatively straightforward to implement, while others might give rise to questions about implementation. Depending on specific bill provisions, such questions could include what constitutes a Confederate symbol, how required agency actions toward Confederate symbols would be funded, whether or not a given display of a symbol would qualify as a historical or educational context, and how implementation would be affected by statutory requirements for historic preservation and other existing protections. H.R. 3658, the Honoring Real Patriots Act of 2017, would require the Secretary of Defense to change the name of any military installation or other property under DOD jurisdiction that is currently named after any individual who took up arms against the United States during the American Civil War or any individual or entity that supported such efforts. H.R. 3779 would direct the Secretary of the Interior to develop a plan for the removal of the monument to Robert E. Lee at Antietam National Battlefield in Maryland. H.R. 3701 and S. 1772 would require the Architect of the Capitol to arrange for the removal from the National Statuary Hall Collection of statues of persons who voluntarily served the Confederate States of America. During House consideration of H.R. 3354, the Interior, Environment, and Related Agencies appropriations bill for FY2018, a number of amendments were submitted regarding Confederate symbols. These amendments would have prohibited funds from being used to create, maintain, or otherwise finance Confederate symbols, each under varying circumstances.9 None of these amendments were made in order by the House Committee on Rules. Separately, an amendment to the FY2017 Military Construction and Veterans Affairs and Related Agencies appropriations bill addressed VA policies on display of the Confederate flag at its national cemeteries. H.Amdt. 1064 to H.R. 4974 would have prohibited funds in the bill from being used by the VA to implement its policy that permitted a Confederate flag to fly from a flagpole at certain times.11 The House of Representatives passed the bill as amended, but the Confederate flag provision was not included in the final omnibus appropriations legislation and did not become law.12 Another bill in the 114th Congress, H.R. 3007, would have prohibited the display of the Confederate battle flag in any VA national cemetery, but also was not enacted. H.R. 4909, the House version of the National Defense Authorization Act for FY2017, included a provision to prohibit military departments from having Senior Reserve Officers' Training Corps units at educational institutions that displayed Confederate battle flags. The provision was included in the House-passed version of the bill but not in the enacted law, P.L. 114-328. Also in the 114th Congress, S. 1689 would have reduced the amounts available to a state under the federally funded National Highway Performance Program and Surface Transportation Program if the state issued a license plate containing the image of a flag of the Confederate States of America. H.Res. 341 and H.Res. 355 would have required the Speaker of the House to remove any state flag containing a portion of the Confederate battle flag from the House wing of the Capitol or any House office building, except when displayed in Member offices. H.Res. 344 would have expressed the sense of the House urging states to remove the Confederate battle flag from public locations, to discontinue the use of the flag in government speech contexts (such as on license plates), and to remove depictions of the Confederate flag from their state flags, and urging businesses to discontinue selling Confederate battle flags and related merchandise. H.Res. 342 contained provisions similar to those that were later introduced as H.Res. 12 in the 115th Congress (see above). NPS manages over 70 units of the National Park System related to Civil War history, some of which contain works commemorating Confederate soldiers or actions.13 Additionally, NPS administers 14 national cemeteries that, under agency policy, may display the Confederate flag at certain times of year.14 The agency also provides education and interpretation related to Civil War history and the Confederate states. Park gift shops operated by concessioners sometimes sell books or other items that display Confederate symbols. Further, NPS is connected with historic preservation of some nonfederal Confederate memorials through its assistance to nonfederal sites such as national heritage areas, national historic landmarks, and nonfederal properties on the National Register of Historic Places. In the wake of recent incidents, these aspects of the NPS portfolio have come under scrutiny. Source: National Park Service, "Shiloh Battlefield—Confederate Monument," at https://www.nps.gov/resources/place.htm%3Fid%3D79. Note: The monument is listed on the National Register of Historic Places. This policy remains in effect unless rescinded or amended. Following the June 2015 shootings in Charleston, House Members addressed the display of Confederate flags at NPS cemeteries in proposed amendments to Interior appropriations bills for both FY2016 and FY2017. The amendments are described in the "Recent Legislation" section of this report. During consideration of FY2016 and FY2017 Interior appropriations, House Members introduced amendments concerning sales of Confederate-themed items in NPS facilities. See the "Recent Legislation" section for more information. NPS also administers national historic landmark designations and the National Register of Historic Places. Through these programs, the Secretary of the Interior confers historic preservation designations primarily on nonfederal sites.37 The designations provide certain protections to the properties and make them eligible for preservation grants and technical preservation assistance. Some nonfederal sites commemorating the Confederacy have been listed on the National Register of Historic Places, and some have been designated as national historic landmarks. In debates about removing Confederate symbols at the state and local levels, these NPS-designated sites are sometimes involved. For example, the Monument Avenue Historic District in Richmond, VA, which contains a series of monuments to Confederate officers, is a national historic landmark district that has been the subject of debate.38 As discussed above, National Register properties and national historic landmarks have some protections under Sections 106 and 110 of the NHPA.39 However, the designations do not prohibit nonfederal landowners from altering or removing their properties. Only if federal funding or licensing were required for such actions would the NHPA protections be invoked. Members of Congress have been divided on the appropriate role of Confederate symbols in the National Park System. Some legislation has sought to withhold funding for the maintenance of any Confederate symbols in national park units, other legislation to withhold funding for certain NPS uses of Confederate symbols outside of a historic context, other legislation to remove particular Confederate symbols, and still other legislation to maintain the status quo in terms of these symbols' presence in the park system. Also divisive has been the question of the periodic display of Confederate flags on headstones in NPS national cemeteries. Proposals concerning Confederate symbols at NPS sites arise in the context of the agency's mission to preserve its historic and cultural resources unimpaired for future generations. Absent congressional authorization, NPS's preservation mandates could constrain the agency from taking administrative actions desired by some, such as removing Confederate commemorative works from NPS units. Under both the Obama and Trump Administrations, NPS has expressed that some Confederate symbols in park units are required to be preserved under NPS statutes and can be framed and interpreted appropriately through educational activities.40 At the same time, the Obama Administration took steps to discourage or end some other uses of Confederate symbols—in particular the use of the Confederate flag in a "stand-alone" context.41 This policy has remained in place under the Trump Administration. The NCA is authorized to provide grants to state, territorial, or tribal governments to assist with the establishment of state veterans' cemeteries.48 These grants may be used only for establishing, expanding, or improving cemeteries and cannot be used for land acquisition or regular operating expenses. State veterans' cemeteries that receive federal grants must adhere to federal law regarding eligibility for interment, but may add additional restrictions on eligibility such as residency requirements. Thus, since Confederate veterans are not eligible for interment in national cemeteries, they are also not eligible for interment in state veterans' cemeteries that receive federal grants. Federal law permits the VA to accept monuments and memorials donated by private entities and to maintain these monuments and memorials in national cemeteries, including those dedicated to individuals or groups.49 The VA website identifies 34 monuments and memorials in national cemeteries that explicitly honor Confederate soldiers, sailors, political leaders, or veterans.50 Some of these monuments and memorials predate federal control of the cemeteries where they are located. For example, one of the Confederate monuments at Point Lookout Confederate Cemetery in Maryland was erected before the state transferred control of that cemetery to the federal government. Other monuments and memorials were more recently established, such as the Confederate monument erected by the United Daughters of the Confederacy and the Sons of Confederate Veterans in 2005 at Camp Butler National Cemetery in Illinois. Table 1 provides a list of national cemeteries with Confederate monuments and memorials and the dates, if available, of their establishment. Source: Congressional Research Service (CRS) compilation of data from the website of the Department of Veterans Affairs (VA) at https://www.cem.va.gov/cem/cems/allnational.asp. Note: The VA does not list the dates of establishment for all monuments and memorials. a. The Shohola Monument, erected in 1911, commemorates the deaths of Union and Confederate soldiers in a railroad accident in Pennsylvania during the Civil War. Veterans interred in national cemeteries, or in state or private cemeteries, are generally eligible for headstones or grave markers provided at no cost by the VA.51 For Confederate veterans, government headstones or grave markers may be provided only if the grave is currently unmarked. The person requesting a headstone for a Confederate veteran may select a standard VA headstone, which includes identifying information about the veteran and his or her service and an emblem of belief corresponding to the veteran's faith, or a special Confederate headstone that includes the Southern Cross of Honor as shown in Figure 2.52 The Southern Cross of Honor was created by the United Daughters of the Confederacy in 1898 and is the only emblem, other than an emblem of belief or an emblem signifying receipt of the Medal of Honor, that may be included on a government headstone or grave marker. Similar to NPS policy, VA policy allows for small flags of the former Confederate States of America (Confederate flags) to be placed at individual gravesites of Confederate veterans, with or without a U.S. flag, on Memorial Day and on Confederate Memorial Day in states that have designated a Confederate Memorial Day.53 In states without a Confederate Memorial Day, another date may be selected by the cemetery administrator. The VA does not provide the Confederate flags. The display is allowed only at national cemeteries where Confederate soldiers and sailors are buried. Any display of a Confederate flag must be requested by a sponsoring historical or service organization, which must provide the flags. The sponsoring organization must also place and remove the flags at no cost to the government. Note: The Southern Cross of Honor medal as awarded by the Daughters of Confederate Veterans includes an image of the Confederate battle flag. When engraved on a government headstone, however, the Confederate battle flag is not included. The current controversy over the display of Confederate symbols on public lands and supported with federal funds affects the VA, its national cemeteries, and current law and policy regarding the provision of headstones for Confederate gravesites. The desire to remove Confederate symbols is balanced against federal policy that permits existing Confederate graves in national cemeteries to remain undisturbed and permits Confederate monuments and memorials in national cemeteries and the use of a Confederate symbol on government headstones. Legislation such as H.R. 3660, which references Confederate symbols, raises questions about how existing headstones, monuments, and memorials would be treated within the context of maintaining national cemeteries as "national shrines," as well as whether or not future headstones issued by the VA for unmarked Confederate graves should include the Southern Cross of Honor. According to the Department of Defense (DOD), a servicemember's right of expression should be preserved to the maximum extent possible in accordance with the constitutional and statutory provisions of Title 10 of the U.S. Code, and consistent with good order and discipline and the national security.58 The Defense Department does not explicitly prohibit the display of the Confederate flag. However, if a commander determines that the display of the Confederate flag or Confederate symbols is detrimental to the good order and discipline of the unit, then the commander can ban such displays. 1. It is critical that all Naval Service Training Command (NSTC) Sailors, Marines, and civilians, as well as the general public, trust that NSTC is committed to providing an environment of equal opportunity (EO) and maintaining an ethnically-diverse workforce. To promote a positive EO environment, Command leaders must avoid associating the Navy with symbols that will undermine our message that NSTC is dedicated to providing an environment free of discrimination or harassment. 2. Reasonable minds differ on what the Confederate battle flag signifies. Some Americans see it as a symbol of racism and hatred, others view it as a symbol of Southern pride and heritage, while yet others consider it an outright political message. When Command leaders associate their unit with the Confederate battle flag, such as by displaying the Confederate battle flag or presenting an award that conspicuously emphasizes the Confederate battle flag, they link the Navy with the meanings that people associate with that symbol—good and bad. Command Leaders should not connect the Navy to the Confederate battle flag in a way that undermines the Navy's message of inclusiveness. However, not all displays of the Confederate battle flag will result in such inferences. A cased Confederate battle flag displayed alongside other Civil War artifacts in a Navy museum is unlikely to be viewed as a partisan statement by the Navy. Command leaders must use good sense in deciding which uses will not undermine our positive EO message. 3. While the First Amendment does not limit which messages the Navy as an organization chooses to convey, it does limit Navy regulation of individual expression rights. Therefore, Command leaders must preserve the free expression rights of NSTC Sailors, Marines, and civilians to the maximum extent possible in accordance with the Constitution and statutory provisions. That said, no Command leader should be indifferent to conduct that, if allowed to proceed unchecked, would destroy the effectiveness of a unit. Command leaders must use calm and prudent judgment when balancing these interests. Some military recruits with Confederate flag tattoos have been barred from joining the military on the basis of policies prohibiting certain types of tattoos. The Army, Navy, Air Force, and Marine Corps all have policies that prohibit tattoos that are injurious to good order and discipline. There is no explicit prohibition against the Confederate flag and symbols in tattoos. However, the Navy does have a general policy regarding the display of the Confederate flag (see above). Army Regulation (AR) 670-1, ‎Uniform and Insignia Wear and Appearance of Army Uniforms and Insignia, prohibits soldiers from having any extremist, indecent, sexist, or racist tattoos or markings anywhere on their body.60 The Army has no specific prohibitions concerning the Confederate flag or symbols. Air Force Instruction (AFI) 36-2903, Dress and Personal Appearance of Air Force Personnel, Chapter 3.4.1, states, "Tattoos/brands/body markings anywhere on the body that are obscene, commonly associated with gangs, extremist, and/or supremacist organizations, or that advocate sexual, racial, ethnic, or religious discrimination are prohibited in and out of uniform. "64 There is no explicit prohibition against the Confederate flag. For more information, see CRS Report R44321, Diversity, Inclusion, and Equal Opportunity in the Armed Services: Background and Issues for Congress. Arlington National Cemetery is under the jurisdiction of the U.S. Army. The Army policy states in Department of the Army (DA) Pamphlet 290–5, Administration, Operation, and Maintenance of Army Cemeteries, that on Memorial Day, or on the day when Confederate Memorial Day is observed, a small Confederate flag of a size not to exceed that of the U.S. flag may be placed on Confederate graves at private expense.65 Individuals or groups desiring to place these flags must agree in writing to absolve the federal government from any responsibility for loss or damage to the flags. Confederate flags must be removed at private expense on the first workday following Memorial Day or the day observed as Confederate Memorial Day. On June 6, 1900, Congress authorized $2,500 for a section of Arlington National Cemetery to be set aside for the burial of Confederate dead.66 Section 16 was reserved for Confederate graves, and among the 482 persons buried there are 46 officers, 351 enlisted men, 58 wives, 15 southern civilians, and 12 unknowns.67 To further honor the Confederate dead at Arlington, the United Daughters of the Confederacy petitioned to erect a monument that was approved by then-Secretary of War William Howard Taft on March 4, 1906, and sculpted by Moses Ezekiel (see Figure 3 and Figure 4).68 President Woodrow Wilson unveiled the memorial on June 4, 1914. Source: Arlington National Cemetery at http://www.arlingtoncemetery.mil/Explore/Monuments-and-Memorials/Confederate-Memorial. Note: Moses Ezekiel was a well-known sculptor and Confederate veteran who was later buried at the base of the monument. The bronze monument stands 32 feet in height and is the South represented as a woman atop a base with a frieze composed of 14 inclined shields for each Confederate state and the border state Maryland. The memorial is surrounded by Confederate graves. Source: Arlington National Cemetery at http://www.arlingtoncemetery.net/csa-memorial-017-062803.jpg. Note: Included in the base are mythological figures and illustrated images of the trials and tribulations of Southerners during the war. Currently there are 10 major Army installations in southern states named after Confederate military leaders and no such installations for the other military departments. For more information on these installations and the naming policy and procedures for each military department, see CRS Insight IN10756, Confederate Names and Military Installations. Legislation has been introduced in the 115th Congress to rename the bases: H.R. 3658, Honoring Real Patriots Act of 2017, would require the Secretary of Defense to rename any military property "that is currently named after any individual who took up arms against the United States during the American Civil War or any individual or entity that supported such efforts." H.R. 3660 would also direct that the bases be renamed and would prohibit the use of federal funds for maintenance of Confederate symbols, including on military installations. Proponents of renaming the bases contend that there are noteworthy national military leaders from other conflicts who demonstrated selfless service and sacrifice, including Medal of Honor recipients, who would be more appropriate for such an honor. Opponents of renaming these installations cite the bureaucracy of creating a new review process and the difficulty of satisfying the various viewpoints over which names (if any) would be selected as subjects of contention. In sum, Congress faces multiple questions and proposals concerning Confederate symbols on federal lands and in federally funded programs. Legislation in the 115th Congress would address Confederate symbols in different ways. Proposals range from those concerned with individual Confederate symbols to those that would broadly affect all Confederate symbols on federal lands. In some cases, questions could arise about how the proposals would be implemented from a logistical and financial standpoint, and how they would interact with existing authorities. For discussions of the role of Confederate iconography in U.S. history since the Civil War, see, for example, David W. Blight, Race and Reunion: The Civil War in American Memory (Belknap/Harvard University Press, 2002), and John Coski, The Confederate Battle Flag: America's Most Embattled Emblem (Belknap/Harvard University Press, 2006). There is no generally accepted definition of what constitutes a "Confederate symbol," and bills related to Confederate symbols have defined the term in different ways. See the "Recent Legislation" section for more information. For example, see Richard Fausset and Alan Blinder, "South Carolina Settles Its Decades-Old Dispute Over a Confederate Flag," New York Times, July 9, 2015, at https://www.nytimes.com/2015/07/10/us/relief-and-resentment-after-confederate-flag-vote-in-south-carolina.html; "Confederate Monuments Are Coming Down Across the United States. Here's a List," New York Times, August 28, 2017, at https://www.nytimes.com/interactive/2017/08/16/us/confederate-monuments-removed.html; Jesse J. Holland (AP), "Officials Grappling With Confederate Names on Public Schools," Washington Post, August 30, 2017, at https://www.washingtonpost.com/national/public-schools-grappling-with-confederate-names-images/2017/08/30/f74db978-8d53-11e7-9c53-6a169beb0953_story.html. For more information, see CRS Insight IN10756, Confederate Names and Military Installations, by Barbara Salazar Torreon and Nese F. DeBruyne. For information on the National Statuary Hall and a list of statues in the National Statuary Hall Collection, see CRS Report R42812, National Statuary Hall Collection: Background and Legislative Options, by Jacob R. Straus and R. Eric Petersen. For additional questions, contact Jacob R. Straus, CRS Specialist on the Congress, at [phone number scrubbed]. For a range of perspectives concerning the removal or retention of Confederate commemorative works in public spaces, see, for example, Kyle Smith, "Destroying Symbols: Where Does It End?," National Review, August 15, 2017, at http://www.nationalreview.com/article/450500/seo-destroying-confederate-statues-whats-end-point-washington-monument; John Daniel Davidson, "New Orleans Is Wrong to Remove Its Confederate Monuments," The Federalist, April 25, 2017, http://thefederalist.com/2017/04/25/new-orleans-wrong-remove-confederate-monuments/; Rich Lowry, "Mothball the Confederate Monuments," National Review, http://www.nationalreview.com/article/450470/charlottesville-virignia-robert-e-lee-statue-remove-right-decision-confederate-monuments-museums; David Graham, "The Stubborn Persistence of Confederate Monuments," The Atlantic, April 26, 2016, at https://www.theatlantic.com/politics/archive/2016/04/the-stubborn-persistence-of-confederate-monuments/479751/; and Garrett Epps, "The True History of the South Is Not Being Erased," The Atlantic, June 11, 2017, at https://www.theatlantic.com/politics/archive/2017/06/the-true-history-of-the-south-is-not-being-erased/529818/. The 10 installations are Fort Rucker (AL), Fort Benning (GA), Fort Gordon (GA), Camp Beauregard (LA), Fort Polk (LA), Fort Bragg (NC), Fort Hood (TX), Fort A.P. Hill (VA), Fort Lee (VA), and Fort Pickett (VA). For more information, see CRS Insight IN10756, Confederate Names and Military Installations, by Barbara Salazar Torreon and Nese F. DeBruyne. For more information, see CRS Legal Sidebar WSLG1383, Confederate License Plates are Government Speech, Rules Supreme Court, by William A. Hornbeck. The case involved a proposal by a group in Texas for a novelty license plate displaying a Confederate battle flag. See House Committee on Rules, H.R. 3354 Amendments, nos. 63 (no funds to create, maintain, or display Confederate symbols on public land), 107 (no funds to create, maintain, or fund a statue venerating a Confederate army official), 123 (no NPS funding to preserve, restore, or construct new Confederate statues), 166 (no funds for National Capital Planning Commission or Interior Department historic preservation related to Confederate memorials), and 185 (no NPS funds to display Confederate flag except in a historic context), at https://rules.house.gov/bill/115/hr-3354. See House Committee on Rules, H.R. 5538 Amendments, nos. 23, 24, and 49, at https://rules.house.gov/bill/114/hr-5538. The VA policy on flying a Confederate flag from a flagpole was provided in Section 8.d.2 of National Cemetery Administration (NCA) Directive 3220. The policy was subsequently amended; see discussion under "Display of Confederate Flags at National Cemeteries." P.L. 115-31, Consolidated Appropriations Act, 2017. For a list of national park units with Civil War resources, see NPS, "Civil War Parks," at https://www.nps.gov/cwindepth/cwparks.html. NPS Director's Order 61, "National Cemetery Operations," at https://www.nps.gov/policy/DOrders/DO_61.pdf, hereinafter referred to as NPS Director's Order 61; and NPS Reference Manual 61, National Cemetery Operations, at https://www.nps.gov/policy/DOrders/RM-61.pdf, hereinafter referred to as NPS Reference Manual 61. CRS communication with NPS Office of Legislative and Congressional Affairs, August 23, 2017. NPS defines a "commemorative work" as "any statue, monument, sculpture, memorial, plaque, or other structure or landscape feature, including a garden or memorial grove, designed to perpetuate in a permanent manner the memory of a person, group, event, or other significant element of history. It also includes the naming of park structures or other features—including features within the interior of buildings." NPS, Management Policies 2006, §9.6.1, at https://www.nps.gov/policy/MP2006.pdf, hereinafter referred to as "NPS Management Policies." See footnote 13 for more information on NPS Civil War parks. Confederate commemorative works are not necessarily confined to park units that relate to the Civil War. For example, NPS administers the statue of Confederate officer Albert Pike that stands in Judiciary Square in Washington, DC. This statue was erected in honor of Pike's service to the Masons, rather than his service in the Confederate army, but includes mention of his Civil War role. 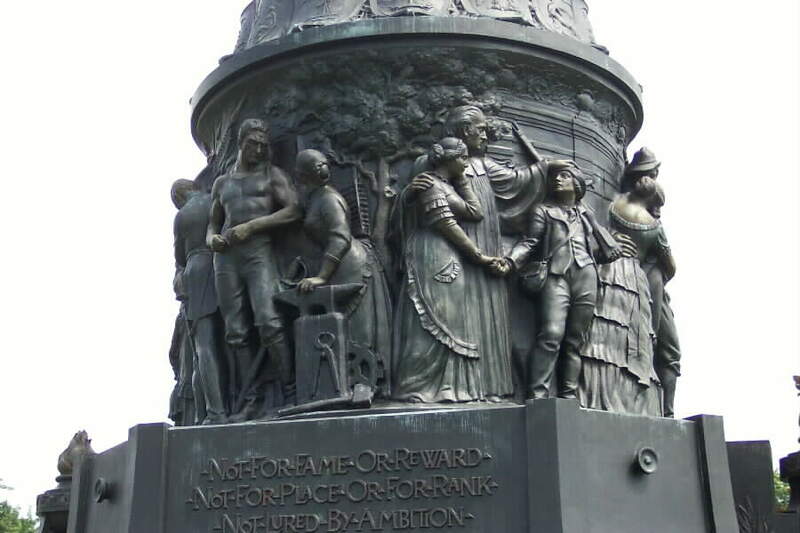 Observers have debated whether the statue constitutes a Confederate monument; see, for example, Amanda Iacone, "Disputed DC Statue Raises Questions About Public Symbols," WTOP.com, August 18, 2017, at http://wtop.com/dc/2017/08/disputed-dc-statue-raises-questions-about-public-symbols/slide/1/. P.L. 89-665, as amended; 54 U.S.C. §300101 ff. 54 U.S.C. §§306107 and 306108. For more on the NHPA's Section 106 and Section 110 requirements, see Advisory Council on Historic Preservation, "Section 106 Fact Sheet," at http://www.achp.gov/docs/ofap-fact-sheet-2016.pdf. Also see regulations at 36 C.F.R. Part 800, and see NPS, "National Historic Landmarks Program," at https://www.nps.gov/history/nhl/index.htm; and NPS, "National Register of Historic Places," at https://www.nps.gov/nr/index.htm. Generally, to be eligible for listing on the National Register of Historic Places, properties must be at least 50 years old and must also meet criteria for integrity and significance. Some Confederate commemorative works in national park units were built more recently—for example, the statue of General Robert E. Lee at Antietam National Battlefield that is proposed for removal in H.R. 3779 was erected by a private landowner in 2003. NPS does not maintain comprehensive statistics on the dates of establishment of Confederate commemorative works in park units. One broad study of Confederate commemorative works throughout the United States found that there were two periods in which the dedication of such works was highest—the 1900-1920 period and the 1950-1970 period (Southern Poverty Law Center, Whose Heritage? Public Symbols of the Confederacy, April 2016, at https://www.splcenter.org/20160421/whose-heritage-public-symbols-confederacy). For more information on National Register criteria, see NPS, "National Register of Historic Places Program: Fundamentals," at https://www.nps.gov/nr/national_register_fundamentals.htm. The Commemorative Works Act (P.L. 99-652, as amended; 40 U.S.C. §§8901-8909) prohibits the establishment of commemorative works in the District of Columbia unless specifically authorized by Congress, and contains other provisions applicable to commemorative works in DC. For more information, see CRS Report R41658, Commemorative Works in the District of Columbia: Background and Practice, by Jacob R. Straus. NPS Management Policies, §§9.6.1 and 9.6.2. For non-Civil War parks, the Director would approve establishment only when there is "compelling justification" and "the association between the park and the person, group, or event is of exceptional importance." Additionally, a person being commemorated must have been dead for at least five years, and a commemorated event must have occurred at least 25 years earlier. Additionally, NPS policies have changed over time; for example, the current policy on removal of commemorative works (NPS Management Policies, §9.6.4) appeared in the 2001 version of the NPS Management Policies, but not in the previous version. Examples include P.L. 84-107, which dedicated Arlington House in Arlington National Cemetery to Robert E. Lee; P.L. 74-167, which established Kennesaw Mountain National Battlefield Park and provided for monuments and memorials to be erected in the park to honor either the Union or Confederate Armies; and 30 Stat. 737 (April 9, 1898), which authorized the monument to Confederate general Albert Pike in Washington, DC, discussed in footnote 16. For example, the 1895 law establishing Gettysburg National Military Park (28 Stat. 651) required the Secretary of War to "establish and enforce proper regulations for the custody, preservation, and care of the monuments now erected or which may be hereafter erected within the limits of the said national military park." Rob Hotakainen, "Zinke, NPS Defend Parks' Confederate Memorials," Energy and Environment News, August 16, 2017, at https://www.eenews.net/greenwire/stories/1060058850/, hereinafter cited as "Zinke, NPS Defend Parks' Confederate Memorials." For NPS policies within national cemeteries, see the section on "Confederate Flags in NPS National Cemeteries." NPS Policy Memorandum, "Confederate Flags," June 24, 2015. NPS, "National Parks and National Cemeteries," at https://www.nps.gov/ande/planyourvisit/np-natcems.htm. NPS Director's Order 61 and NPS Reference Manual 61. NPS Reference Manual 61, p. 33. NPS Policy Memorandum, "Confederate Flags," June 24, 2015, hereinafter cited as NPS June 2015 Policy Memo. The memorandum stated that Confederate flags were defined to include the Stainless Banner, the Third National Confederate Flag, and the Confederate Battle Flags. For more information on national heritage areas, see CRS Report RL33462, Heritage Areas: Background, Proposals, and Current Issues, by Laura B. Comay and Carol Hardy Vincent. For example, the Tennessee Civil War National Heritage Area, whose motto is "Telling the Whole Story of America's Greatest Challenge, 1860-1875," preserves commemorative works and historical sites related to the Union and Confederate sides of the war, including sites related to the African-American experience. For more information, see the website of the Tennessee Civil War National Heritage Area at http://www.tncivilwar.org/. For information on the National Historic Landmarks program, see NPS, "National Historic Landmarks Program," at https://www.nps.gov/history/nhl/index.htm. For information on the National Register of Historic Places, see NPS, "National Register of Historic Places," at https://www.nps.gov/nr/index.htm. For example, see Paul Bedard, "Richmond, 'Capital of Confederacy,' Braces for Battle Over Robert E. Lee Monument," Washington Examiner, August 14, 2017, at http://www.washingtonexaminer.com/richmond-capital-of-confederacy-braces-for-battle-over-robert-e-lee-monument/article/2631422. See footnote 18 for more information. Under Section 106 (54 U.S.C. §306108), before approving any federally funded or permitted undertaking, federal agencies must take into account the effects of the undertaking on historic properties and may need to engage in certain consultations. Under Section 110(f) (54 U.S.C. §306107), before approving any federal undertaking that might directly and adversely affect a national historic landmark, federal agencies must "to the maximum extent possible" make plans and take actions to minimize harm to the landmark. See, for example, NPS June 2015 Policy Memo, and "Zinke, NPS Defend Parks' Confederate Memorials." NPS June 2015 Policy Memo. For more information, see CRS Report R44924, The National Park Service's Maintenance Backlog: Frequently Asked Questions, by Laura B. Comay. National Cemeteries Act of 1973, P.L. 93-43, 38 U.S.C. §2403(c). For additional information on the history of National Cemeteries, see Department of Veterans Affairs, History and Development of the National Cemetery Administration, October 2015, at https://www.cem.va.gov/cem/docs/factsheets/history.pdf. For additional information on the interment of Confederate soldiers, sailors, and veterans in National Cemeteries, see Department of Veterans Affairs, Federal Stewardship of Confederate Dead, July 2016, at https://www.cem.va.gov/CEM/publications/NCA_Fed_Stewardship_Confed_Dead.pdf. 38 U.S.C. §2408. A list of state veterans' cemeteries is at https://www.cem.va.gov/cem/cems/allstate.asp. Information on each national cemetery, including information on monuments and memorials, is at https://www.cem.va.gov/cem/cems/allnational.asp. 38 U.S.C. §2306. For additional information on burial benefits available to veterans see CRS Report R41386, Veterans' Benefits: Burial Benefits and National Cemeteries. Available emblems of belief are at https://www.cem.va.gov/hmm/emblems.asp. For Union Civil War veterans and veterans of the Spanish-American War, headstones with a shield engraved in the background are available. Department of Veterans Affairs, Flags in VA National Cemeteries, NCA Directive 3220, November 22, 2005, Section 8.d.1. H.Amdt. 1062 to H.R. 4974 (114th Congress). The VA policy on flying a Confederate flag from a flagpole was provided in Section 8.d.2 of NCA Directive 3220. Letter from Ronald E. Walters, Interim Undersecretary for Memorial Affairs, Department of Veterans Affairs, to Representative Jared Huffman, August 12, 2016, at http://huffman.house.gov/sites/huffman.house.gov/files/8.12.16%20Walter.%20Letter%20from%20Veterans%20Affairs%20Reg.%20Conf.%20Flag%20Displays.pdf. Department of Defense Instruction (DoDI) 1325.06, Handling Dissident and Protest Activities among Members of the Armed Forces, 2009 (incorporating change 1, February 22, 2012), at http://www.esd.whs.mil/Portals/54/Documents/DD/issuances/dodi/132506p.pdf. NSTCINST 5000.1F, Naval Service Training Command (Enclosure 7), Policy Statement Regarding the Confederate Battle Flag, August 29, 2017, at http://www.netc.navy.mil/nstc/NSTC_Directives/NSTC_Instructions/NSTCINST%205000.1F%20-%20NSTC%20Policy%20Statements.pdf. AR 670-1,‎ Uniform and Insignia Wear and Appearance of Army Uniforms and Insignia, March 31, 2014, Chapter 3 Appearance and Grooming, 3-3 b and c. Tattoo, branding, and body mutilation policy, p.10, at https://www.army.mil/e2/c/downloads/337951.pdf. Naval Personnel Command (‎NAVPERS) Instruction 15665I, General Uniform Regulations, Chapter 2, Grooming Standards, Section 2: Personnel Appearance, Article 2201.7: Tattoos, at http://www.public.navy.mil/BUPERS-NPC/SUPPORT/UNIFORMS/UNIFORMREGULATIONS/CHAPTER2/Pages/2201PersonalAppearance.aspx#tattoos. Marine Corps Bulletin (MCBUL) 1020, Marine Corps Tattoo Policy, June 2, 2016, at http://www.marines.mil/Portals/59/Publications/MCBul%201020.pdf?ver=2016-06-01-152020-223. Note: MCBUL Corps Bulletin 1020 is extended until November 3, 2017, and applicable to the Marine Corps Total Force. Jeff Schogol, "Confederate Flag Tattoo Stops Man from Joining Marines," Marine Times, January 26, 2016, at https://www.marinecorpstimes.com/news/your-marine-corps/2016/01/26/confederate-flag-tattoo-stops-man-from-joining-marines/. Air Force Instructions (AFI) 36-2903, Dress and Personal Appearance of Air Force Personnel, February 9, 2017, p. 22, at http://static.e-publishing.af.mil/production/1/af_a1/publication/afi36-2903/afi36-2903.pdf. DA Pamphlet 290–5, Administration, Operation, and Maintenance of Army Cemeteries; see Flags Used on Memorial Day 2-7 on p.2, and Grave-Decorating Flags 6-11 on p. 30, at http://www.apd.army.mil/epubs/DR_pubs/DR_a/pdf/web/p290_5.pdf. Arlington National Cemetery, "Confederate Memorial," at http://www.arlingtoncemetery.mil/Explore/Monuments-and-Memorials/Confederate-Memorial. According to this site, after the Spanish-American War "in the spirit of national reconciliation, the U.S. Congress authorized that a section of Arlington National Cemetery be set aside for the burial of Confederate dead." Included were the Confederate soldiers buried in the national cemeteries at Alexandria, VA, and at the Soldiers' Home in Washington, DC and reinterred in the Confederate section in 1901. Vera Bergengruen, "No Plans to Change Names of Bases Honoring Confederate Generals," Military Times, August 17, 2017, at http://www.military.com/daily-news/2017/08/17/no-plans-change-names-bases-honoring-confederate-generals.html.